For Christmas, Chris gave me a copy of Lidia's Commonsense Italian Cooking. I love Lidia. Her cookbooks always fun to read and filled with recipes that I want to try. The first recipe I tried from this book was Barley Soup. Perfect for this time of year when it is just so darn cold. I made the whole recipe and have a couple of portion tucked away in the freezer. And a sneak preview- We are eating at Becco on Saturday!!!! Put the ham hock in a saucepan, and cover them with water. Bring to a simmer, and simmer for 10 minutes to remove some saltiness. Drain and rinse. In a large soup pot, over medium heat, heat the olive oil. When the oil is hot, add the potatoes, and saute until they being to brown and stick to the bottom of the pan, about 5 minutes. Add the leeks, carrots, and celery, and saute until everything is coated with oil. Add 8 quarts of water, the split peas and the ham hocks, and bring to a rapid simmer. Simmer, uncovered until the peas have broken down, about 45 minutes. Add the barley, and simmer until tender, about 45 minutes. 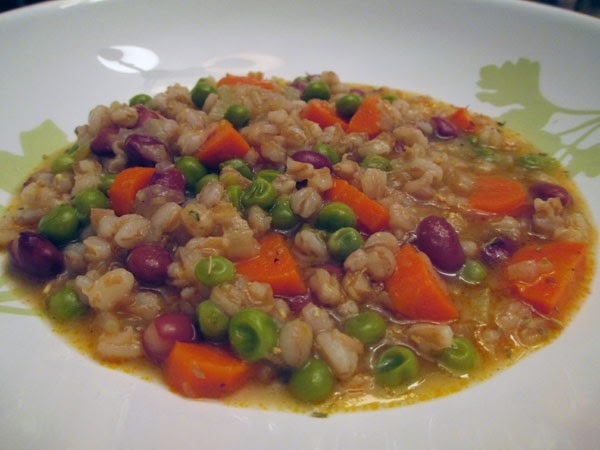 The split peas should be broken down and have made the soup thick and creamy at this point. Add the spinach, corn and salt and simmer until the spinach is tender, about 10 minutes. Serve hot. 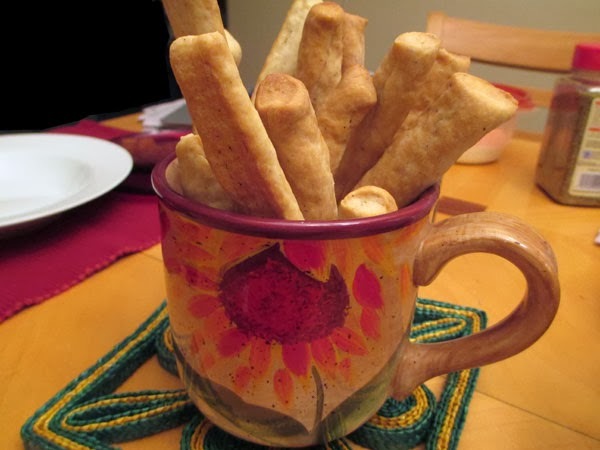 With the soup we had Black-Pepper Breadsticks. I found the recipe on the Food and Wine site. They tasted just like Frezels, little black pepper crackers my mom made. I am not sure I have the spelling correct on that. I will have to check with my sister. Preheat the oven to 350° and line 3 baking sheets with parchment paper. In the bowl of a standing electric mixer fitted with the dough hook, combine the water, yeast and 2 tablespoons of the flour and let stand until foamy, about 5 minutes. Add the remaining 3 cups of flour along with the shortening, salt and pepper and knead at medium speed until the dough is smooth and elastic, 7 to 8 minutes. Cover the bowl with plastic wrap and let the dough rest for 15 minutes. Turn the dough out onto an unfloured work surface and divide it into fourths. Cut each quarter into 8 pieces. Roll each piece into a 9-by-1/2-inch rope. Using a knife, trim the breadsticks to 8 inches; arrange on the baking sheets and bake for about 45 minutes, until golden and firm, shifting the pans halfway through baking. Transfer the breadsticks to racks and let cool before serving. It says 3 cups of Barley. This recipe looked so awesome on TV but I couldn't find it on the public television websites or on her website. Thank you so much for sharing! I am looking forward to making it.